Abstract: Nanophotonics, by localizing light to the sub-wavelength volumes and dramatically enhancing local fields, is enabling a myriad of unprecedented opportunities for construction of novel photonic devices and systems. In this talk, we will present her research team’s recent work on integrated plasmonic metamaterials and their applications. We will first introduce an ultrasensitive infrared nanospectroscopy technique. Infrared spectroscopy, which directly measures vibrational fingerprints of the biomolecular/chemicals in mid-IR frequencies, is a powerful identification and analysis tool. However, its low sensitivity so far limited the applicability of this technique. By engineering on-chip nano-antennas, we will demonstrate that infrared plasmonics can overcome fundamental Lambert-Beer’s law and enhance vibrational signatures of proteins by more than 100,000 times enabling spectral measurement of even single molecular monolayers. We will also show that by employing Fano-resonances on asymmetric metamaterials, structural information regarding crucial protein-protein interactions can be extracted. These novel technologies by enabling measurements of protein activity and structure from ultra-low quantities of molecules can open up a new paradigm in vibrational spectroscopy. For surface based bio-sensors operating at low analyte concentrations, relying only on diffusion to transport analytes to the device surfaces severely limits sensor performances. We will show that by uniquely integrating nanophotonics and nanofluidics on the same platform, one can overcome this limitation while dramatically improving sensor response times. We will then show that sub-wavelength optofluidic sensors can sensitively and reliably detect live and intact viruses in biological media at medically relevant concentrations. We will also demonstrate a plasmonic platform enabling massively multiplexed, on-chip and label-free protein microarrays for high-throughput screening applications. We will then introduce a novel nanofabrication method enabling high-throughput, large area and low-cost fabrication of metamaterials and bio-molecules at high-resolution. We will show that this method also enable patterning on flexible, stretchable polymers and non-planar surfaces. 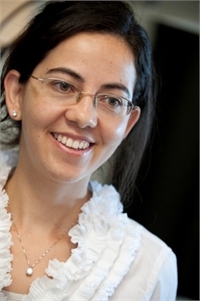 Biography: Hatice Altug received her Ph.D. degree in Applied Physics from Stanford University in 2006. She joined Boston University Electrical and Computer Engineering Department as an assistant professor in 2007. Her research group focuses on integrated nanophotonics, nanoplasmonics and nanofluidic systems and their application in biosensing, vibrational nanospectroscopy and optical communication. Dr. Altug is the recipient of Optical Society of America Adolph Lomb Medal, Presidential Early Career Award for Scientists and Engineers, Office of Naval Research Young Investigator Award, National Science Foundation CAREER Award, Massachusetts Life Science Center New Investigator Award, IEEE Photonics Society Young Investigator Award and Boston University College of Engineering Early Career Research Excellence Award. She received Peter Paul Career Professorship, Intel Graduate Student Fellowship, IEEE Photonics Society Graduate Student Fellowship. She is the winner of 2004 Inventors' Challenge competition of Silicon Valley and 2005 IEEE Photonics Society Best Paper and Research Excellence award.